So you’ve found a job and are about to sign your employment contract? Congratulations! The Netherlands offers a high level of protection for employees’ rights and generous employment benefits. Just make sure you clearly understand all the terms of your contract, as well as the most prominent Dutch and European labor laws they are based on. As these laws are quite complex and comprehensive, we have listed a step by step walkthrough. The first important thing to know is that most contracts of employment are based on collective labor agreements (so-called collectieve arbeidsovereenkomst, or cao). These are written agreements that cover benefits and working conditions, like maternity and paternity leave, working overtime, childcare, education, pensions, contract termination and other employee benefits. These caos have been negotiated by labor unions and employers’ organizations and they apply to whole sections of an industry or a specific corporation at sector level. Its provisions are usually more generous than statutory requirements, but they can never contradict Dutch law. For a cao to apply to you, it’s not necessary for you to be a member of a union. If no cao exists, you’ll need to negotiate your own terms and conditions. Aside from the cao, the amount of money you will earn, the number of vacation days and your benefits package, such as a company car and phone, depend entirely on your contract and negotiating skills. At loonwijzer.nl (Dutch) you can check the market rates for your particular position. Here you can also calculate your net income after tax and social security deductions. Most employers offer a standard holiday allowance of about 8-10% of your yearly salary, paid out in the May, on top of the standard one month of paid leave. Other stipulations, like the Dutch minimum wage and the minimum number of vacation days, and regulations about the notice period, dismissal, equal treatment and health and safety are all regulated by law. Below is a quick overview of the most important howwhat- whys of working in the Netherlands. Aside from the eleven Dutch public holidays in 2018, every worker has the right to a minimum of four times the number of hours he/she works per week. For most people that means twenty holidays a year, though most employers offer 25 days (weekends excluded). If you don’t take all the vacation days that you are entitled to, you can transfer them to the first six months of the fol lowing year. If you still haven’t taken them by then, they will be annulled without compensation or payment. For these vacation days, employees are paid their full salary. In some cases it’s possible to take extra days off, in exchange for a corresponding cut to the salary. If you make more than three times the minimum wage (which is around €22.000 annually), your standard holiday allowance can be reduced or annulled altogether. The only exception to this rule is if you were unable to take your vacation days due to sickness or a heavy workload, in which case you can keep your holidays for a total of five years. In any case it’s always best to communicate clearly with your employer when is the best time to take a vacation. If your employer offers you a fixed-term contract, for example for six months, this contract can only be renewed twice, for a maximum of two years in total. When the fixed-term contract exceeds the period of two years, it automatically becomes a permanent contract for unlimited time. However, a six-month interval between two contracts cancels out these terms, after which you can start over if both you and your employer so desire. In case of a six-month contract, there can be no trial period. For a short-term fixed contract of less than two years, the trial period may not exceed one month. 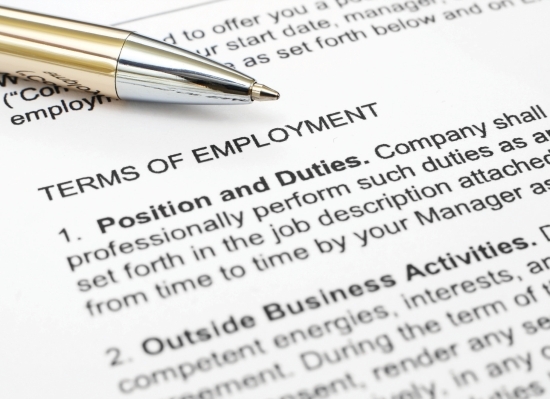 During a trial period, both the employer and employee have the right to end the employment contract at any time. After this time, the notice time for ending employment is usually one month and sometimes two. If you have a permanent contract for an unlimited period, your employment can only be terminated with your consent or otherwise through the Institute for Employee Insurance (UWV) or in court. Either the UWV or the judge will make an assessment of the grounds for your termination. If the employer fires an employee on the spot without good reason (fraud, theft or dangerous behavior) and without obtaining the prior approval of the employee, the dismissal can be nullified. Valid reasons for terminating employment are the economic restructuring of the company or a history of unsatisfactory performance by the employee, which in both cases must be well-documented and proven to the UWV and/or in court. If you, as an expat, change jobs, you will have to report this to the IND within one month, or risk a penalty. You won’t have to apply for a new residence permit, but your new employer may have to apply for a new work permit. If you worked as highly skilled migrant before, make sure your new employer falls under the highly skilled migrant construction. If you wish to extend your work permit or residence permit, your personal circumstances will be assessed again. However, if you’ve worked for three years on the same residence permit, allowing you to work – such as the employee single permit or your partner’s permit, you will no longer be required to have a separate work permit for your new job. After three years, you can also change your residence status to ‘labor’, meaning you can work without a permit and without adhering to the conditions for the highly skilled migrant scheme. In the Netherlands, every working resident is legally obliged to pay social security contributions. If for some reason you will become unemployed after working for a while in the Netherlands, you will be entitled to receive unemployment benefit payments. If you’ve worked for 26 out of the 36 weeks before the employment contract ended, you will receive 75 percent of your salary for two months, and then 70 percent afterwards. On the website of the Ministry of Social Affairs and Employment or the UWV you can find more information on Dutch labor practices. Expatriates from the European Union should be aware that, aside from stringent Dutch employee protection laws, freedom of movement is an inviolable right, allowing Europeans to work anywhere in the Union. Other protections that have been enshrined in EU legislation include employees’ equal treatment, wage protection, working hours regulations, safe working conditions which minimize exposure to risks, protection against employment termination, the right to join unions and to vocational training and protection of employees when an employer becomes insolvent. You can find more information on European labor law on eur-lex.europa.eu. Any person whose nationality is within the European Economic Area (EU plus Norway, Iceland and Liechtenstein) as well as Switzerland is allowed to work in the Netherlands. If you come from outside the EU, make sure you have legalized copies of important documents such as your birth certificate, diplomas etc. You must also apply for a visa before coming to the Netherlands. • You have a residence permit that says ‘Work freely allowed’. On your passport you should also have an official sticker saying ‘Work freely allowed’. • You have a valid combined permit for residence and work (GVVA). • Your employer has a valid work permit for an employee from outside the EEA. You must then also have a valid residence permit, e.g. an authorization for temporary stay (MVV). • International corporate workers, students, trainee assistants, artists and musicians. • Special rules apply to asylum seekers and knowledge workers with sound qualifications. • Non-European students studying in the Netherlands, who want to do an internship. • A separate application procedure applies to senior managers, specialists, sports coaches, athletes and artists. When a company from another EEA country provides services in the Netherlands and legally employs persons from a third country, a work permit is not needed. • Open a bank account. • Go to the doctor or hospital. • Enroll your children in school. At the municipality you also register your home address, either if you’re renting or staying with someone else. In both cases you need to bring the proper documentation. The next step is to open a bank account. Furthermore, when living and working in the Netherlands, health insurance is mandatory, so get one as soon as possible. • Holidays and holiday pay. • 70% wage payment in case of illness. Additional employment perks, which you receive on top of your actual wage, are usually based on a collective labor agreement (CAO) and can include an end-of-year bonus, additional vacation days, full wage payment in case of illness and a lease car. In the CAO, a large number of legal requirements and collective agreements have been stipulated. These include rules about the minimum wage, the maximum number of hours you are allowed to work per day and per week, night shifts, health and safety regulations, working for a temp agency and more. Just like everybody else, you will have to do your taxes. See page 43 for all the taxes that employees pay in the Netherlands.